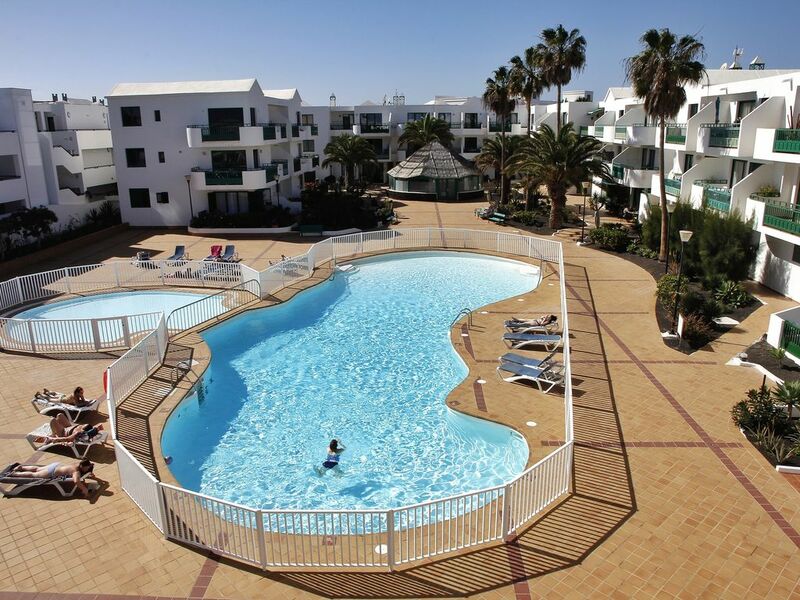 Apartment located in a small and quiet complex facing the sea, on the beach of Las Cucharas in Costa Teguise. With balcony overlooking the pool and room overlooking the beach, fantastic location for an idyllic holiday. Modern and fully equipped kitchen with microwave oven, dishwasher, washing machine, Nespresso coffee machine, water heater, juicer and toaster. It has a dining room for four people. Comfortable and modern lounge with 55 'TV and flat screen with 70 foreign channels in English, German, French, etc. and wifi and direct access to a balcony with dining for two and sun loungers overlooking the pool. Bathroom with spacious and bright shower, equipped with hair dryer and complete towel set and beach towels. Bedroom with double bed of 180 x 200 with special resting mattress and ergonomic pillows. Large wardrobe with pants and shoe rack for comfort and rest is total. It has bath and beach towels, large hair dryer, toilet paper and hygiene products. Small quiet complex on the sea front, with direct access to the beach of Las Cucharas. I walked 5 minutes from a shopping center and Pueblo Marinero as area day and night entertainment. 5 minutes of bus and taxi, as well as, rent a car. Supermarkets and restaurants in the area and beaches where you can go swimming, windsurfing, water skiing, biking, etc. Enjoyed our stay here. Very clean modern apartment with back entry gate almost on the beach. Spar supermarket almost below with all others shops and restaurants nearby. Surprisingly quiet at night, during the day you did get to hear music from the holiday complex next door. All the usual amenities including beach towels. Appreciated Susi's warm welcome, good communication and complimentary bottle of wine! Lovely holiday apartment with views of the sea and beach from the front. Clean,tidy/ well equipped. We had such a great time last week. Plenty of nice places to eat, easy access to the beach and sea with nice walks. Exactly what we wanted. We will be re booking soon. Fantastic apartment in the perfect location. Having been to Teguise last year we were familiarised with the area so we knew where the apartment complex was situated,,we looked at the photos and reviews and decided that it would be ideal. Communications throughout with the owner Suzi was second to none,she met us on arrival and gave us a walk through of the facilities within the apartment. We were absolutely delighted with everything, you would literally only need to take your clothes as it a home from home, washing machine,dishwasher, fridge freezer,large HD tv which we were able to connect to our Netflix through,an android box so you could watch some British tv, a drawer full of toiletries ( should you forget something) washing machine/dishwasher tablets, even has a Nespresso coffee machine ( my husband loved that) etc I could go on but believe me it has everything and if not there is a spar shop right outside. The apartment balcony gets the sun from 9:30ish am - 5:30ish pm ( we went in November so depending on which time of year you go you would probably get it longer. Large double bed was amazingly comfortable and views from the bedroom was fabulous in the morning/evening looking out over the beach. The separate beach entrance was just at the bottom of the stairs from the apartment, which takes you right onto the main beach. Really centralised for beach and eating/ drinking and shops. We will definitely be back and would most certainly recommend it to others. I have been visiting Lanzarote for over 40 years, and this apartment is without doubt the best I have ever stayed in, everything is very high spec and all your needs will be catered for, from beach towels, to a drawer full of essentials too many to mention. The apartment is in the perfect location with the complex overlooking the beach, and a back gate leading it, Suzi is the perfect host and was most helpful, oh and did I mention free beer in the fridge and a complimentary bottle of wine. Thank you very muck Suzi. The location of the apartment is located on the sea front, where it has windsurfing schools and shopping center and places of daytime and evening entertainment 5 minutes walk. The golf course is a 15 minute drive. Bus and taxi stops 5 minutes walk. Restaurants, cafes, car rentals, Pub, hairdressers, etc. a 5 minute walk.